The Archaeological Imaging Research Consortium (ArcImaging) includes an international membership and is a 501(c)(3) Non-Profit Private Foundation which is focused on researching biblical and historic cities, sites, objects and locations based on the scientific means of Archaeological Imaging, Ground Penetrating Radar, Satellite Imagery, and Airborne Remote Sensing with follow up on-site archaeological studies. There are numerous ancient and biblical sites that Archaeological Imaging Research Consortium (ArcImaging) plans to research throughout the Near East and Middle East. Results from Archaeological Excavations, Digital Elevation Models, Satellite Imagery, Surface Surveys and Photograph Surveys can be collaborated in a common database which is composed of various text and imagery data and other pertaining multimedia data. The largest university in Eastern Turkey, Ataturk University, and ArcImaging have signed an Agreement to Collaborate to on archeological studies in Eastern Anatolia (Turkey). ArcImaging is working with the Ataturk University Archaeology Department under the direction of the Faculty of Sciences & Arts. ArcImaging President Rex Geissler worked with Ataturk University on the Agreement of Collaboration in Erzurum, Turkey. ArcImaging posted the Turkey Photo Album from their work with Ataturk University and travels around Turkey in October, 2000. ArcImaging hosted the Rector and Dean of Sciences & Arts who are over the Archaeology Department at Ataturk University, Turkey, for an international team meeting, which included many scientific tours and ArcImaging presentations. The Turkish Embassy announced on October 10, 2001 that for the first time since 1990 an international research group, ArcImaging, received federal permission from the Turkish Government and various Turkish Ministries including the Military and the Ministry of Culture to perform research on Mount Ararat. ArcImaging is extremely pleased and grateful to the nation of Turkey and to Ataturk University for their support in this scientific research. Based on the 2001 ArcImaging permission granted by the Turkish Government entities, the ArcImaging Team directed by Dr. David Livingston and coordinated by Rex Geissler, conducted the extremely successful and productive 2001 ArcImaging Mount Ararat Research Expedition. ArcImaging looks forward to working together with the nation of Turkey as this scientific research continues over the upcoming years and decades to come. Both the ArcImaging President and Vice President were also featured on the 2001 History Channel Documentary, History's Mysteries: The Search For Noah's Ark, which was aired nation-wide numerous times. ArcImaging President Rex Geissler was a guest at his Excellency Turkey's 7th President Kenan Evren's Scholarship Dedication for Turkish Studies at Florida Atlantic University on March 25-26, 2002. ArcImaging is a financial supporter of the scholarship fund and of T.A.B.E.C., the Turkish-American Business, Education, & Cultural Development Committee that helped coordinate the scholarship fund in President Evren's name. ArcImaging was fortunate to meet with and discuss Mount Ararat Archaeological Research in collaboration with Ataturk University with President & General Kenan Evren, Turkey's current Minister of Culture Istemihan Talay, the Turkish Ambassador to America in Washington D.C. Dr. O. Faruk Logoglu, former United States Secretary of State, Chief of Staff, & General Alexander Haig, United States Congressman Robert Wexler, the Honorable Ismet Karading, Mayor of Marmaris, Turkey, and Florida Atlantic University President James Catanese in Boca Raton, Florida. ArcImaging officers/directors B.J. Corbin, Gary Pryor and Rex Geissler originally discussed Mount Ararat research with T.A.B.E.C. President Suheyla Gencsoy and her husband Tahsin in Ft. Lauderdale. Suheyla has been supporting ArcImaging as its Director of International Relations for Turkey and has discussed this research with numerous officials in Turkey. ArcImaging is a group of researchers that focus on using the latest remote sensing and archaeological technology for biblical sites of interest. Use a variety of aerial and ground remote sensing instruments to search both surface and subsurface areas of the ancient kingdom of Urartu (rival to the Assyrian Empire) and other historic areas in the Near East looking for pre-Urartian civilizations. ArcImaging is working with the government of Turkey, Ataturk University, and international friends to utilize these technologies. Develop an extensive multimedia database of archaeological research using a combination of ArcView, Adobe Acrobat and other Web-based software. 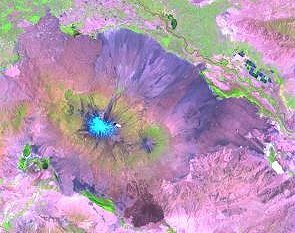 ArcImaging now has the confidential ArcImaging Capitalization Proposal available for the Year 2003 ArcImaging Research Activities including the Mount Ararat Ice Cap Sub-surface Survey and much more archaeological research. The ArcImaging Capitalization Proposal is available for high net-worth individuals and organizations. For those interested, please contact the ArcImaging Director of Finance Gary Pryor to apply for the ArcImaging Capitalization Proposal and subsequent tax-deductible contributions. Archaeological Imaging Research Consortium (ArcImaging) is a completely certified and official 501(c)(3) Non-Profit Private Foundation that can legally accept Tax Deductible Donations and Contributions. Every donor will receive a receipt that they may use as a Tax Deduction in their Tax Return. If you are interested in giving a Tax Deductible Donation to finish the extensive Sub-Surface Survey of Mount Ararat once and for all, please contact Gary Pryor for the mailing address.